It stretches to accommodate anything you put inside it. 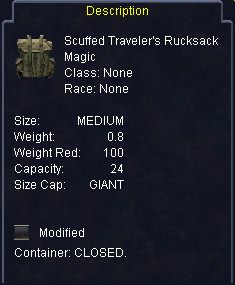 Scuffed Traveler's Rucksack droped on The judicator in plain of War from The Judicator. Greeta dropped one last night. It was found in Two Sides of the Stone. Picked one of these up today from Holy Ophidian in Rubak Oseka. Pleasant surprise, since I was under the impression these scuffed bag drops were only available from named in HoT expansion. High Priest Darsia in Sanctum. Has also dropped from Old Rusty in HoT, lower floors. Damar the Overseer in Erudin Burning.